Mark your calendars, gents. The IBS 600-yard Nationals are slated for the weekend of September 30th through October 2nd. 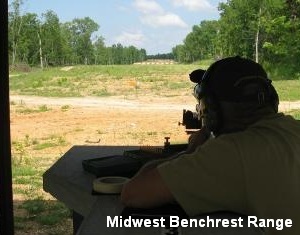 The event will be held at the Midwest Benchrest Range in Yukon, Missouri. The 2011 600-yard Nationals consist of an 8-target Aggregate match in Light Gun (LG), plus an 8-target Aggregate match in Heavy Gun (HG). There will be a total (LG + HG) of 16 record targets (5 record shots each [80 total]). After a safety meeting, the match begins at 9:00 am on FRIDAY September 30th, and continues on SATURDAY, October 1st. Sunday October 2nd is a reserve day if needed due to weather delays. Thursday, September 29 will be the last day to register. The range is also open on Thursday 9:00 am to 6:00 pm for sight-in and set-up. NOTE: Due to the nature of this event, practice/sight-in will not be available on match days (9/30 – 10/2) prior to the start of the matches. Story Tip from Sam Hall. We welcome reader submissions. Share the post "IBS 600-yard Nationals Set for Sept. 30 – Oct. 2 in Missouri"
1. They appear to be very long, sleek and aerodynamic, while they still maintain a good bearing surface length (full-diameter shank). I like bullets with a sufficient bearing surface length because I find that it makes for bullets that are easier to shoot and tune. I also feel a good bearing surface length makes for a bullet that has a better potential for consistent performance over bullets with a short bearing surface. 2. The published ballistic coefficient (BC) numbers on these bullets are quite high. They have a stated G1 BC of .547 and a G7 BC of .278. Looking at the bullets themselves it’s easy to see why these BC numbers are so high. The front end of the projectile is quite long and similar to what you see on long-range VLDs, but the transition to the bearing surface has a blended appearance (the Hybrid part) vs. the sharp transition you typically see with most VLDs and secant ogive bullets. The 105gr Hybrid bullets also have a long boat-tail. 3. 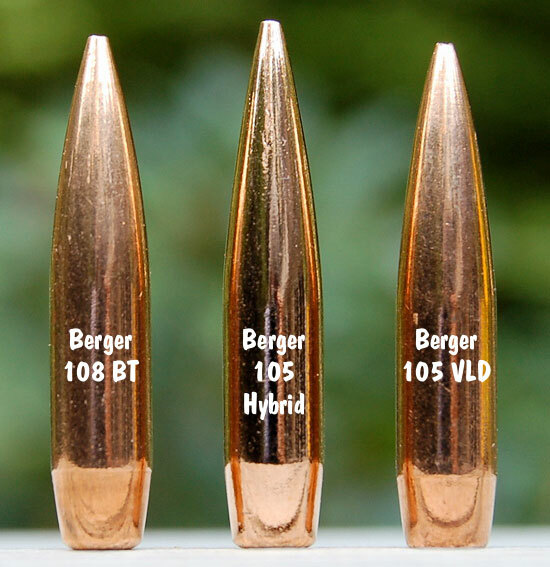 The new Berger 105gr Hybrid bullets measure right around 1.261″ OAL. 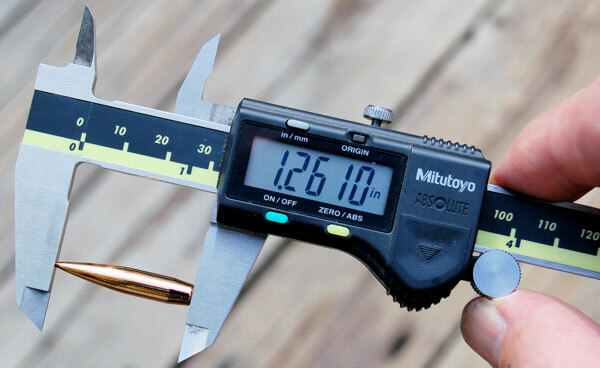 By comparison, the many other 105gr to 108gr bullets I’ve measured all seem to run in the range of 1.210″ to 1.225″ OAL. The Berger 105gr Hybrid bullets are thus a fair bit longer than the others, which is why a true 1:8″ or faster twist is recommended for them. The bearing surface diameter of the new Hybrids was dead on at 0.243″. So these bullets are neither “fat” nor “skinny”. 4. The tips on these bullets are quite uniform, with the meplats closed up nicely. The Hybrids have nice small tips similar those on the Berger 108s (reasonably tight in diameter). While I sometimes like to point my match bullets, I like to shoot bullets that are ready to go “out of the box”, and these are just that. I’m hoping they will perform very well without meplat trimming or pointing. Berger has done its own in-house testing on these bullets and found them to be accurate and appropriate for release for additional testing by shooters out in the field. Unless this additional field testing reveals something that no one anticipated (which I doubt), I suspect these new projectiles will be one of Berger’s most popular bullet offerings. The planned official release date for the new 6mm, 105gr Hybrids has been tentatively set for mid- to late-October of 2011. So, barring some last minute changes, these 105s should be on dealers’ shelves before Thanksgiving. Share the post "Berger’s New 6mm 105gr Hybrid Match Bullets — First Look"
Norma has announced a recall of certain lots of Norma 217 powder, product # 20932175 (500gr cannister). According to Norma: “The present batch of 217 powder is recalled as it can give high pressure under some circumstances. We hope to have a good batch available later this autumn.” Norma 217 is commonly used for magnum cartridges. Norma describes 217 as a “flexible magnum powder, suitable where there is relatively large case volume in relation to the bore size.” Norma has not yet published the lot number(s) of the affected 217 powder batch. 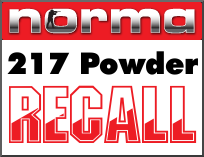 Share the post "Norma Recalls 217 Powder"